Kraig is a freelance writer based out of Nashville, Tennessee who has covered adventure travel for TripSavvy since 2013. Kraig writes about high altitude mountaineering, polar exploration, and other extreme adventures, often contributing to outlets like Outside magazine, Popular Mechanics, Digital Trends, Gear Junkie, and a wide variety of other outdoor focused blogs and publications. 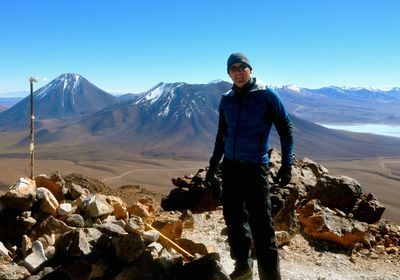 Kraig is the founder and editor of The Adventure Blog, which is frequently updated with news from extreme expeditions taking place around the world. His Adventure Podcast offers similar content in an audio format. Kraig has been a travel writer for more than a decade, focusing mainly on the adventure travel space. During that time, he has seen this style of travel grow from a niche market into a full-fledged phenomenon that attracts tens of thousands of adventurous people each and every year. Since his career as a writer started, Kraig has contributed to various websites and print publications, including National Geographic Adventure, Huffington Post, Outside magazine,Popular Mechanics, Gear Junkie, Gear Instittue, Digital Trends, OutdoorX4 magazine, and numerous others. His own Adventure Blog has also carved out a unique space in the outdoor adventure community. His travels have taken him to six continents and numerous countries. He has studied martial arts in China, traveled by horseback through the Altai Mountains of Mongolia, and visited Everest Base Camp. Kraig has camped in the Sahara Desert, climbed Kilimanjaro, and spent time in a training camp for safari guides. His journeys have taken him up the Amazon River, across the Southern Ocean, and into the Atacama Desert, the driest place on the planet. He has wandered through the Outback, camped in the crater of a volcano, and dogsledded above the Arctic Circle. There is no adventure too big or too small to attract his interest. He has been contributing to TripSavvy since 2013. Kraig has recently finished his first book, which is scheduled for release in the early 2019, and is already working on his second. He has also launched an adventure-focused podcast that talks about travel, exploration, and outdoor gear, while also interviewing interesting athletes, filmmakers, mountaineers, and explorers. Kraig graduated from Iowa State University with a Bachelors degree in Political Science, and has a background in information technology.